Travel can be a hassle. A few tacky trinkets and impersonal photos don’t always seem worth dealing with airport security, lost baggage and language barriers. But that’s nothing compared to what Petey Pendant, hero of Alexander Lading’s Sky Tourist ($1.99), goes through for his souvenirs and snapshots. It might be bad enough that he’s trying to get into places with locked gates, frightening security and hostile aliens. Might be, but he’s also taken the maddest method of travel out there. He’s strapped a chain between two rockets and hung himself from the chain—like a pendant, naturally. I can’t quite imagine a more complicated way to travel. You control the rockets, itself a simple task. 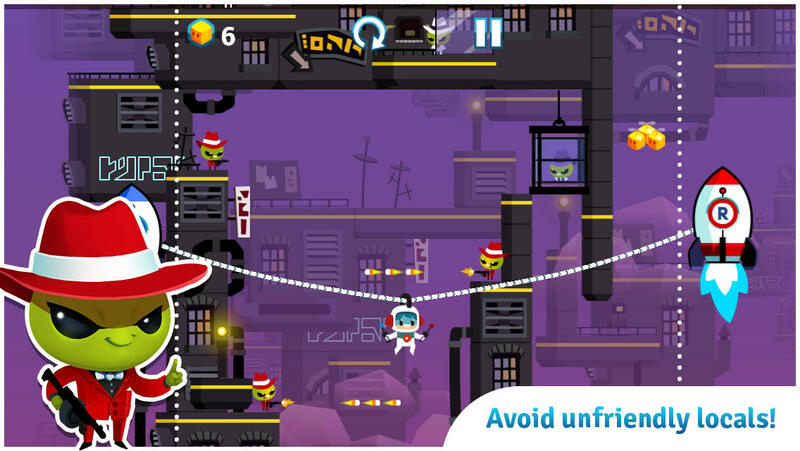 Place a finger or thumb on either side of the screen and slide it up to make the rocket fly, down to make it descend. 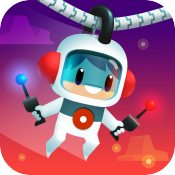 The chain is linked to both rockets, so you manipulate it by controlling their flight. If you move them both up gently, Petey ascends. If you raise one before the other, he’ll slide to the side. Most importantly, if you snag him against anything and move too quickly, the chain will break and Petey will die, spiralling back to the last checkpoint. 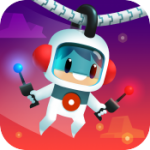 With careful control of the rockets, you can make your way through Sky Tourist’s 78 levels. These are split over three worlds, with lovely cubic vistas, cute aliens and charming music. It’s a bright, colorful galaxy to explore. The exploring, on the other hand, is a mixed bag. Since your goal is always to reach the top of the level, every challenge is a variation on slowing you down. Complex mechanisms often get in the way, mechanisms that you’ll need to manipulate to push on through. Some of these are as clever as can be, while others rely on frustratingly precise nudges. Hit it just here and you’ll progress—be too slow or miss that sweet spot and you’ll lock yourself in. The only recourse is suicide and a quick trip back to the last checkpoint. As a result, some levels are smooth sailing while others are mind-bogglingly irritating. Occasionally you’ll have to pull off a very cool trick to find your way to a secret—a souvenir salesman, perhaps, or a stash of cubelets. Other times you’ll work through a gauntlet that takes you halfway back through a level simply to find the item you need to progress. It’s a bit like getting lost in a foreign country and knowing the best you’ll get out of the experience is a helping hand back to your hotel. These frustrations are relatively few in a game that usually succeeds, though. Playing it, I felt clever more often than stymied, charmed more often than frustrated. Except when the charming bits went grim. When Sky Tourist is good, it’s very very good. When it’s bad, it’s vicious. At times you’re more like a sky colonialist, killing the natives completely by accident and getting rewarded for it. It doesn’t feel so bad when they start shooting back, but violence is always a bad way to start a trip—particularly a trip as otherwise cute and welcoming as this one. Sky Tourist boasts clever controls and a beautiful world. Travelling through that world means dealing with occasional frustrations, but they’re small bumps in an expansive road. Every good journey has its problems, after all—without them, how would we grow?